Why should you go on a storm chasing tour? Unless you are 100% certain you want to go on a storm chasing trip you (or your friends) might ask yourself “Why should I go on a storm chasing trip?”. In this article we will try to explain why so many people find it exciting to go storm chasing. The reason many people choose to go on a storm chasing trips is the great mix of adventure and nature. Storm chasing is, however, not an adventure sport for adrenaline junkies even though it can be intense at times. Being on a storm chasing tour is the chance of observing something that very few people around the world have seen. The sight of a huge tornado touching down a few miles next to you, destroying everything in its pass and stretching all the way up into the sky is a sight that will never leave your retina. Knowing what Mother Nature can do when she is at her worst mood may change they way you look at the sky forever! 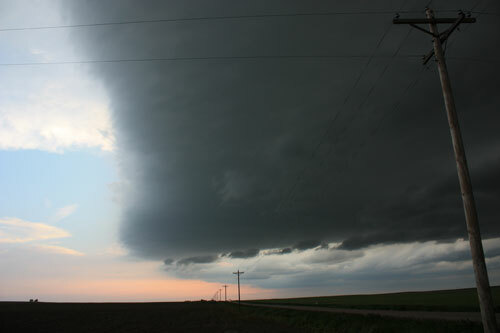 You may also experience the breath taking views of supercells, that appear to come out of the sky as alien spaceships. Almost perfectly rounded clouds that look like pancake stacks will leave you with awe of what nature is capable of. If you live in an area of the world that does not get severe thunderstorms but just thunderstorms once in a while it may be difficult to get an idea of what a supercell thunderstorm really is. The supercell thunderstorm is far different to “normal” thunderstorms you have experienced in the past. Those summer thunderstorms that puts some dark clouds on the sky, throws some lightning and shakes the atmosphere with some thunder. Rotating supercells create patterns and shapes you do not see in normal thunderstorms. Tornadoes. L a r g e tornadoes. These are not just thin, weak tornadoes that destroys your neighbour’s dog house. Supercell thunderstorms can create tornadoes that lift houses, stay on the ground for a long time and create amazing scenery. Supercell storm structures. This is really something else than dark skies. The entire sky may be clear, blue skies with the exception of a perfectly rounded and extremely well defined supercell storm cloud. Eery does not begin to describe the feeling! Large hail. If you have seen hail before you might just think of hail as “summer snow”. When you see the hail that supercells produce you will come to think of hail more like artillery fire. Just golf ball sized hail hitting your car is intense, but hail can be up to baseball sized. MASSIVE lightning. Lightning, and thunder, is always a slightly terrifying but beautiful sight. The major difference you will experience is that the lightning will be much more frequent, stretch higher and longer and form fantastic “web” shapes. 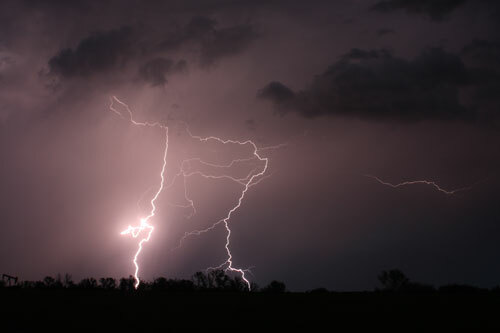 You may feel the vibration under you feet when a lightning strikes hard nearby. Sounds, colors, feelings. A supercell thunderstorm often create a greenish color (believed to be created by hail) that will make the storm look even more out of this world. Added to the sounds of thunder you can also hear the roaring sounds of a tornado, hail roar and sometimes also dead silence. You will also experience the feeling of very quick and sudden wind changes and really strong winds. You will experience amazing lightning shows. Just like any type of safari you have no real idea of what your particular tour might bring you. If you are lucky you could leave with memories, and photos, that will be some of the craziest things you have ever seen. Part of the excitement of the tours is to not really know what you can expect. Arriving to your tour will start a feeling of anticipation that you will bring with you every day. This anticipation may be busted and leave you disappointed some days but it pretty much only takes one Great Day to make up for it. On a Great Day you may start with a morning briefing where the tour guide explains the outlook for the day. With a good outlook you start getting a certain feeling of excitement and anticipation. The closer you get to the region where you will chase you will start getting reports of storms popping up in the neighborhood. While driving up to a storm it could go from just being a rapidly growing cloud to a storm. Thirty minutes later the NOAA is officially initiating a warning that this storm is declared severe (for strong winds and large hail). You know something big might happen. The excitement increases when the tour guide explains how everything with the storm is starting to come into place: the humidity looks good, the wind shear is sufficient, the storm has “broke the cap” and visibly it is starting to look real good. The feeling spreads in the van: it is just a matter of time now! Reports are starting to come in: there is strong rotation in the cloud according to the doppler radar, very large hail has been observed and now the NOAA is issuing a tornado warning for the storm. You need to get in position! The radar is showing a very promising view of a supercell with a significant “hook”, a rotation marker and a tornado warned area. Above you is an anvil full of mammatus clouds and the storm cloud looks eerily green. Finally, the wall cloud you have been observing for a while shows strong rotation, shapes into a cone and starts to lower towards the ground. 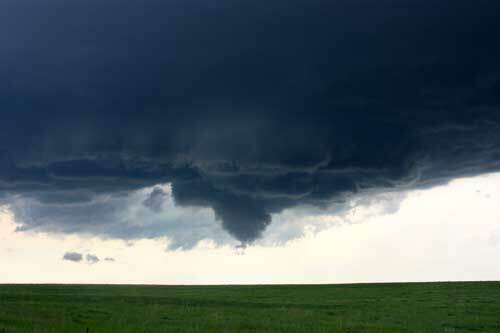 A funnel clouds starts to shape and connects to the ground. You are watching a tornado. The cloud is spinning out a funnel cloud that is lowering itself towards the ground. It is just a matter of seconds now! Quickly, the tornado grows in size and becomes a monster. Large hail starts to fall down and you can feel the strong winds moving into the storm. You need to re-group. Now! Accompanied by the heavy sound of hail smashing against the roof of the car you regroup to a new, better and safer, position where you can watch the tornado in all its natural beauty. An impressive sight outside of your window. After some re-groupings and hundreds of photos later you see the tornado rope out, making it appear like a snake miles up into the sky. Suddenly that ropes faints into nothing and you stand amazed. This is how an encounter with a tornado could feel like but there are several ways you may see tornadoes, supercells and experience hail, lightning, thunder and strong winds. A great place to start and get an understanding of the amazing things you may see in a supercell thunderstorm is Google Images. Check out the blogs of storm chasers, tour operator photo galleries etc for inspiration and some amazing photos. Google images of mammatus clouds – Mammatus clouds are a very peculiar type of clouds that are more or less common to see together with a supercell thunderstorm. 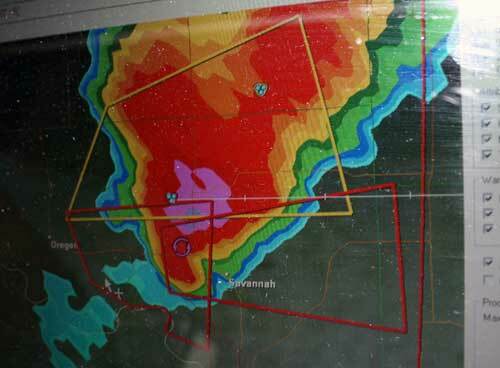 StormStock – great collection of severe weather photos from storm chasers. Videos of tornadoes and other supercell weather phenomena are really the best way of understanding just how things may look during a storm chasing tours. “Dramatic tornado compilation” – Great mix of amazing tornado videos and dramatic music. “Tornado best movie” – One of the most popular tornado compilation videos on Youtube. Great footage, well edited, spectacular videos but not the best image quality. 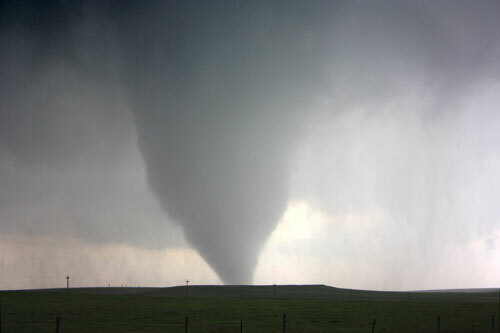 “Best of 2011” – Great compilation of different storm chasing videos and photos from a storm chaser. “Supercell time lapse” – Beautifully made time lapse of a supercell. TornadoVideos.net – Great compilation of tornado videos from storm chasers. Feel free to contribute with links to your favorite videos and photos in the comment field below.